Juan Guaido, head of Venezuela's opposition-run congress, declares himself interim president of Venezuela, during a rally demanding President Nicolas Maduro's resignation in Caracas, Venezuela, Jan. 23, 2019. In less than a month, Juan Guaido has gone from a virtual unknown in Venezuelan politics to the country's most-watched figure, assuming the presidency of the opposition-controlled congress and briefly being detained by the secret police. On Wednesday, the skinny 35-year-old from the South American country's hardscrabble Caribbean coast thrust himself onto the international stage with the boldest challenge to socialist President Nicolas Maduro's rule in years: he declared himself interim president, a move swiftly recognized by the United States, Canada and many Latin American countries. His rapid ascent has raised hopes that he could fill a leadership vacuum in Venezuela's notoriously divided opposition, which has failed in several attempts to oust Maduro and his predecessor Hugo Chavez. Many of its most prominent figures have been jailed, exiled or barred from seeking public office. The salsa-loving baseball fan has animated the opposition’s upper-class base and won over many working-class Venezuelans fed up with the country's hyperinflationary economic collapse, who have taken to the streets demanding Maduro step down. Yet Guaido still needs the backing of the armed forces to achieve his goal of forcing new elections. "Today in Venezuela we are living under a dictatorship, and we need to put on enough pressure to take control," Guaido, the grandson of National Guard and Navy officers, said in an interview with Reuters this week. He has proposed an amnesty for members of the military, but said members of the Maduro government who committed human right violations should be punished. 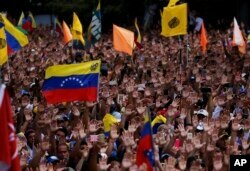 Anti-government protesters hold their hands up during the symbolic swearing-in of Juan Guaido, head of the opposition-run congress who declared himself interim president of Venezuela. "I do not intend to heal the wounds of 20 years, but nor do I intend to hide them." Guaido took the helm of the National Assembly on Jan. 5 with a call for the armed forces to recognize Maduro as a “usurper" after his May 2018 re-election vote, widely viewed as fraudulent. He went on to study engineering, but became involved in politics while at university and received a master's in public administration from George Washington University in the United States. He is married with a 1-year-old daughter. Representing Vargas for Popular Will, Guaido assumed the parliament's leadership as part of a power-sharing agreement between Venezuela's main opposition parties. He has said little about what policies he would pursue as president, but Popular Will describe themselves as center-left social democrats. His whereabouts on Wednesday evening were unknown. Guaido has said he is not afraid of being arrested, boosting his popularity among Venezuelans tired with Maduro. "I am giving Guaido my vote of confidence," said Jose Luis Galindo, a Caracas firefighter wearing a gas mask around his neck at a protest against Maduro on Wednesday. "It is time to escape from this anarchy we have lived through for more than 20 years. I am here for my children’s future, and I will stay for as long as it takes."